When we got the video of a rowdy sports fans attacking an Australian reporter, everyone instantly at work thought it was my twin or doppelganger. What do you think? Below is the story of what happened. 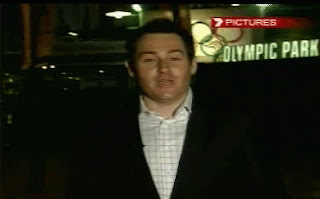 An Australian Seven Network journalist was tackled to the ground and punched by two men on live television outside Olympic Park, following a Rugby League game in Melbourne on Sunday. 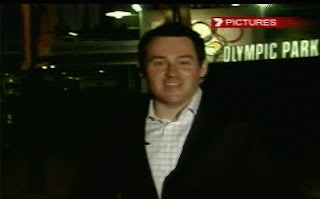 Reporter Ben Davis suffered minor injuries in the attack, which occurred as he did a live cross to Channel Seven’s Brisbane news bulletin from outside the Melbourne stadium on Sunday evening, police said. Police said a group of men was involved in the assault. One of the men tackled Davis, pushing him to the ground, while another punched the reporter in the back of the head. “I could see getting hit in the back of the head, the side of the head, and when I was on the ground there might have been a few kicks and stuff. But again, it just happened so fast, I didn’t even realise what was happening at the time. I just wanted to, when I realised probably the gravity of it all, and there were three or four of them on me, I just wanted to get the hell out of there,” Davis said.